Located in North Cambridge with easy access to Alewife station and a walking distance to Davis and Porter Squares, Cambridge Park complex offers modern living at its best. The building amenities include 24 hour resident concierge, resort style swimming pool, dry-cleaning services, Wi-Fi hot spots in common areas, BBQ in outdoor patios, and garage parking. Units offer studio, one- and two-bedroom apartments with wall-to-wall carpeting. Apartments feature full size washer and dryer, storage space, contemporary kitchens with maple wood cabinetry, frost-free refrigerators, multi-cycle dishwashers, built-in microwaves, stainless steel sinks and disposals, garden bathtubs, walk-in showers. All units are pre-wired for high-speed Internet and cable. 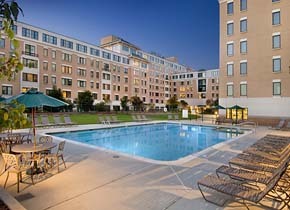 Contact us for more information about these Cambridge Park apartments.